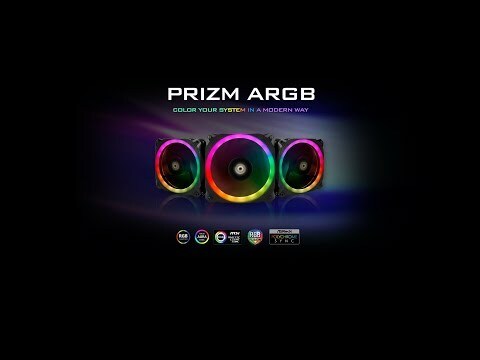 The Prizm ARGB series case fans come in two sizes, 120 and 140mm. 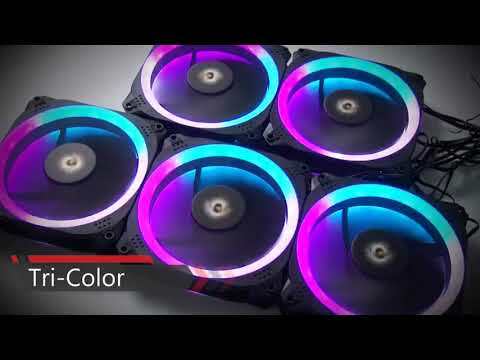 They feature a dual-ring aperture design, which allows you to display RGB effects on both sides of the assembly. Each LED bead can emit a variety of lighting colours to enrich your vision. Enjoy nearly 16.8 million customised RGB colours and effects through compatibility with top-end motherboard manufacturers. With up to 16.8 million colours, coordinate your own custom schemes for endless variety. Multi-function fan controller for up to 5 fans. Easily switch between light modes to create a unique custom colour. Fan speed automatically adjusts according to temperature, effectively reducing system noise while achieving excellent heat dissipation. Prizm fans use hydraulic bearings to reduce noise and friction whilst lasting up to 40,000 hours. Shock absorbing rubber pads at all corners protects the fan and reduces vibration noise between the fan and the chassis. Features • 5x 120mm PWM Fans + Controller. • 2000rpm max fan speed. 120mm Antec Prizm 5 Pack with Controller, ARGB, 7 Blade, Upto 2000RPM, Upto 45.03CFM Airflow, 32.6dB Max, PWM is rated 3.0 out of 5 by 2. Rated 1 out of 5 by RetrogamerX from Simple awful I bought these and thought I would save a little money and it arrived broken. I will never buy another Antec product ever again. Rated 5 out of 5 by lee09 from didnt sync with my motherboards app When i called scan to check the fans would work with my msi mortar 450m i was told yes with mystic light but after fitting them ect they wouldnt sync i later then found out they wont because of being 5v not 12v .